Add to the mix the prehistoric beast Tarbosaurus bataar, a Cretaceous critter reputedly so irritable and given to mood swings that it’s believed even the infamous Tyrannosaurus rex gave it a wide berth. The story, under the delightful heading ‘Bones of Contention,’ first came to public attention — that is to say, when The New Yorker picked it up — in 2012, though to be fair, not to mention accurate, the story probably begins more than 70 million years ago, when the Tarbosaurus was an actual thing. The Tarbosaurus came by its bad temper naturally: It weighed up to five tons, and boasted more than 60 teeth. But wait, there’s more. It had a locking mechanism in its lower jaw, similar to the space alien in the horror movie Alien, and small, gimpy forelimbs that predate opposable thumbs by more than a few White House presidential administrations. Tarbosaurus was no bottom feeder, either. It ate other dinosaurs, the larger the better. The hadrosaur Saurolophus and sauropod Nemegtosaurus were favoured items on the buffet menu, and they were not small. In present-day natural history terms, think of a lion that’s only interested in hippos and elephants, with buffalo having to serve as a light snack between meals on an otherwise slow day on the hunting plain. The largest known Tarbosaurus skull is 1.3 metres (4.3 ft) long, which makes sense when you consider we’re talking about a critter that ranged between 10 and 12 metres (33to 39 ft.) from snout to tail, and weighed some four to five metric tons. The weird gets truly going when, on May 20, 2012 Heritage Auctions in New York City published a catalogue announcing that a fully restored Tarbosaurus skeleton was about to go on the auction block. 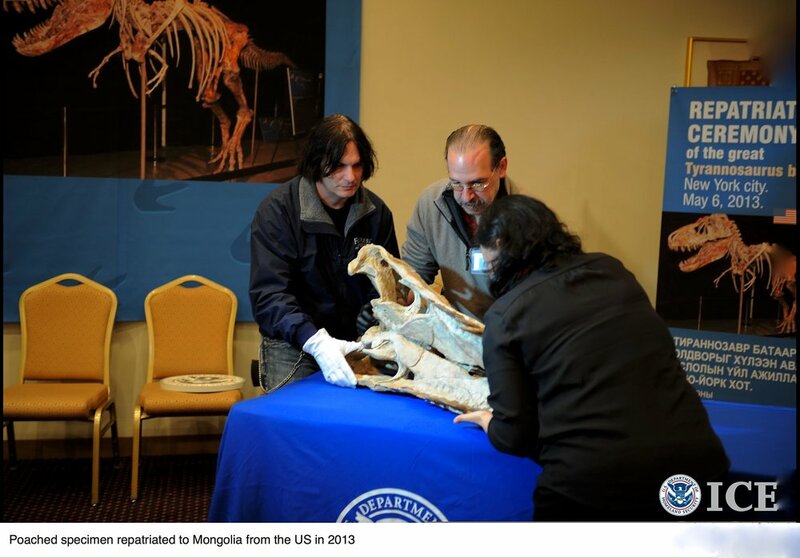 This was a problem — though hardly anyone guessed at the time it would be a problem that would involve a million-dollar bone smuggling scam — because Mongolian law stipulates that any dinosaur remains found in the Gobi Desert must be laid to rest at an appropriate Mongolian institution. Since Tarbosaurus are only found in Mongolia and not, say, Iowa, or New York City, this Tarbosaurus, if real, could only have been stolen. Enter “commercial palaeontologist” and real-life “Florida man” Eric Prokopi, a present-day Indiana Jones — except that he isn’t — who was willing to part with the dinosaur bones for no small amount in US cash — until, that is, the then-president of Mongolia, and more than a few actual palaeontologists, gave it the old ‘WTF?’ and filed a complaint in the US courts. On the morning of Oct. 17, 2012, as Paige Williams wrote at the time in The New Yorker, federal agents and sheriff’s deputies raided Prokopi’s home in Gainesville, Florida and arrested him. The would-be Indiana Jones, dubbed a “one-man black market,” was charged with several counts of felonious smuggling. And so an actual court case, United States v. One Tyrannosaurus Bataar Skeleton — the case has its own Wikipedia page! — came to light. Prokopi, caught dead-to-rights and facing 17 years in prison, pleaded guilty to illegal smuggling. Facing hard time, he sang like a bird. “There is probably not an active fossil investigation at this point that doesn’t owe, on some level, to information that Mr., Prokopi has furnished law enforcement,” assistant US attorney Martin Bell told US District Court Judge Alvin Hellerstein during Prokopi’s sentencing hearing in lower Manhattan. 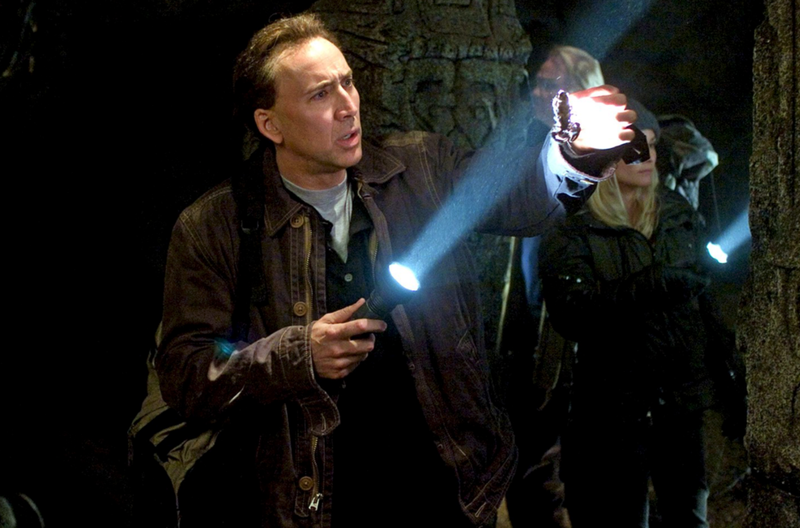 Hollywood actor Nicolas Cage, meanwhile, agreed to return the bones a dinosaur skull he bought in 2007 for some USD $276,000, handing it over to US authorities, who in turn returned it to Mongolia. Cage originally bought the skull in an auction held by the I.M. Chait gallery — outbidding Leonardo DiCaprio in the process. Cage didn’t realize the skull might be stolen until the Prokipi affair — movie title! — and voluntarily gave it up when he learned of the circumstances. Sure, he was out nearly $300,000, but now he had one hell of a story to tell. Might not a movie be made out of this — starring, say, Nicolas Cage and Leo DiCaprio? “Every now and then it airs on TNT,” Bell replied, presumably with a straight face. The Tarbosaurus skeleton was returned to Mongolia the following year, bruised but not battered, where the remains were put on public display in Sukhbataar Square, in Ulaanbaatar, Mongolia’s capital (pop. 1.3 million). For one brief moment, this Tarbosaurus became the most famous dinosaur in the history of the planet, a strangely fitting end for a critter that died of unknown causes in the Gobi Desert, its skeleton more-or-less intact, some 70 million years ago. Perhaps it died of natural causes? If it had been taken on by a Tyrannosaurus, or another Tarbosaurus, it’s hard to imagine the bones would have survived without being scattered across the Mongolian Steppe. Why is this suddenly in the news again, now, in October, 2018? Because Williams, whose side job — in addition to her staffing duties with The New Yorker — is Laventhol/Newsday Visiting Professor at Columbia University’s Graduate School of Journalism, has just published her novel account of the strange case, who has just published a new book, The Dinosaur Artist: Obsession, Betrayal and the Quest for Earth’s Ultimate Trophy (Hachette). The Dinosaur Artist is unlikely to survive 70 million years, but Williams’ fellow authors have jumped onboard, for the most part. With a wonderful story to tell, it would appear. Older PostMagical circus beasts, and where to find them — a digitized ‘Carnivale’ of the Animals.